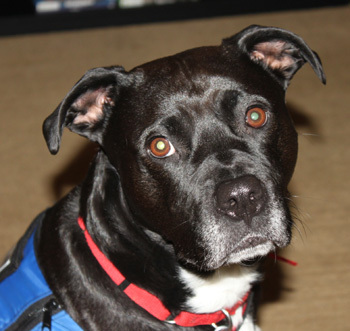 My name is Pat Marcum, and I have a “granddog” named Freya who we believe is a full blooded American Pit Bull Terrier. First let me tell you a little about her and how my son ended up with her. At the time he lived in Nicholasville, Ky., and this very skinny, sickly puppy kept ending up on his doorstep. My son knew where it belonged, and he would return it to the “breeder” in the backyard. Well, one day she was on his steps again, and she looked close to death, and he couldn’t stand it any longer, so he brought her to me. I checked her gums, and they were as white as can be, and her skin was just laying on her bones, but she was so happy to be with us. My son took her to the vet, and they treated her for worms, and she started to improve. My son did call the humane society, and they came out and said that because of her condition and breed they would put her down if they took her. Even though my son and his family didn’t have much money, he decided to keep her. The humane society took pictures of her and told him that if the breeder came back to claim her when she got well to call them and they would deal with the breeder and her condition. Well, Freya flourished in her new loving home. I really didn’t see her for about another year, and boy was she a rude little girl, jumping and running like a crazy animal, so I took her to obedience class (and to tell you the truth, I was a little afraid of her because of everything I had heard about pits). But she was so smart and she loved everyone and still does. She totally made me believe it isn’t the breed, it’s the owners no matter what anyone says. I have had German Shepherds, Rottweilers and Dobermans, and I loved them all. They were the best, most loving and loyal dogs I’ve ever had, and Freya falls on the top of that list. After she graduated, I heard about the Love on a Leash therapy pet program. They were so welcoming, and they were always there to help you along as you learned the ropes. What a great group to volunteer with! 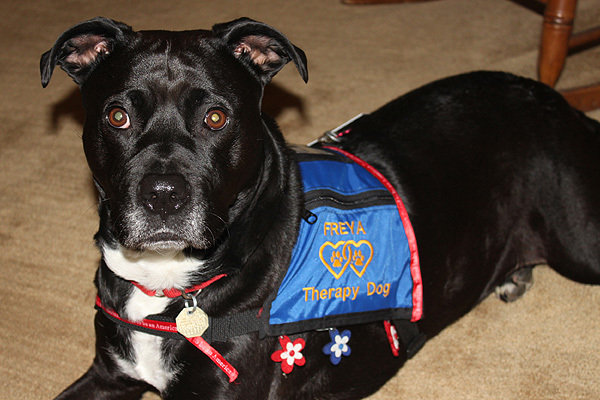 I took her to be certified by Love on a Leash, and she has been a certified therapy dog now since November of 2008. Freya, meaning goddess of love in Norse mythology, is now 6 years old. 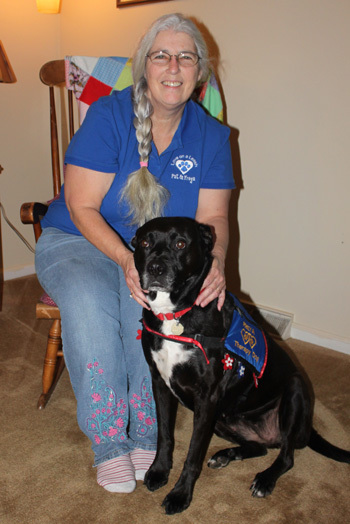 She visits nursing homes, a veteran’s hospital and veteran’s center. In the past she has also gone to the library so that children can read to her, and she has gone to elementary schools. She has been to several Bark in the Park events and even got to kiss Ms. Kentucky once! Freya has brought a lot of love to many people, but I think the best thing about her is when people see a pit bull they immediately think she is mean or doesn’t like dogs; Freya has turned so many people’s minds around. She is such a great ambassador for the breed. The worst thing about her is her tail – it never stops wagging, and when I do take her to nursing homes, I have to make sure her tail is not hitting another patient! There have been so many wonderful visits, but one visit at the VA hospital especially stands out. Freya and I were walking down the hall, and a minister came out of a room and asked if we could go in and visit this patient he had been sitting with who was very depressed being there. When the patient saw Freya, he just lit up with a big smile, and Freya did a “paws up” where she puts her paws on the bed to make it easier for the patient to pat her head, and he cried. He said he could tell Freya cared about him and wanted to make him happy at that moment, and she did want him to be happy. 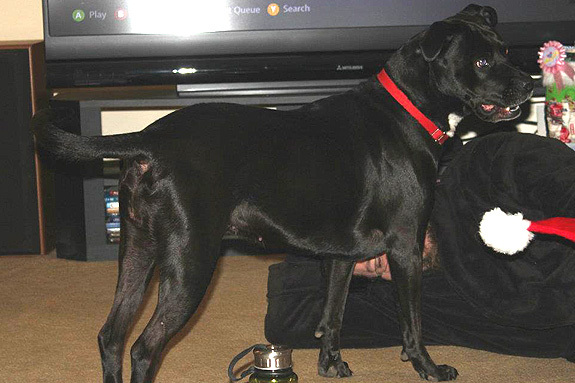 When we left, we all felt warmth in our heart, and it was because of this 65-pound American Pit Bull Terrier whose tail won’t stop wagging and who will kiss you if you let her. What a feel good story! Now I’m concerned about the breeder and the dogs that’s in her/his care. 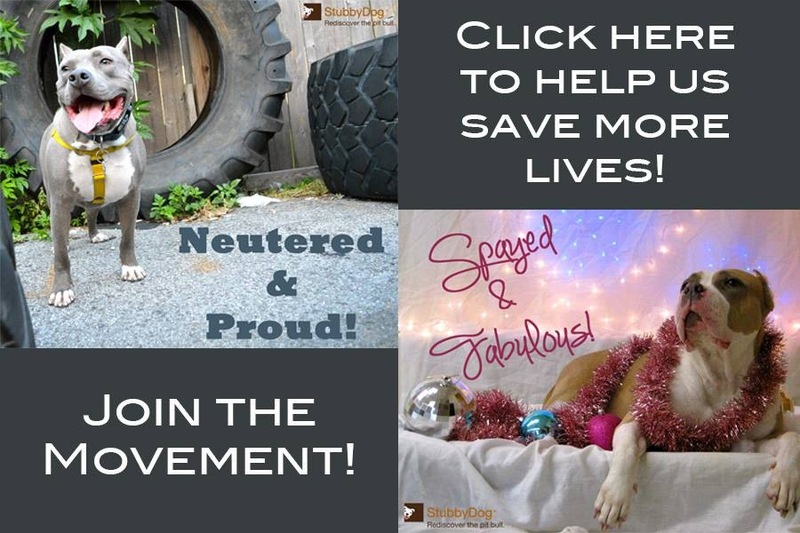 @theprettychic It’s always a concern when people ‘breed’ pit bulls or any other type of dog and clearly don’t take care of them and are doing it for profit. Luckily Freya found herself a great home and is a wonderful example of how amazing pit bulls are. @StubbyDog What bothers me is when I suggest fanciers should be licensed. It is my opinion if you have to be licensed and sanctioned by the state it will cut down on backyard breeding. Thank God Freya was one of the blessed ones. @theprettychic We totally agree with you on that one Kelli! And what we love is that Freya picked her own home. Smart girl!!! What a pretty girl! Love that she was saved by good people! Hello all, this is Freya’s best friend and I thought I would fill in a few more blanks. I have had the good fortune of raising Freya from a pup. At the time, I did not want a dog. As much as I love them, I did not feel it was a good time to have one. Freya picked me though and insisted I fight for her. Looking at her I am sure you can see clearly that resisting her charm was futile. I also knew despite the fact my home would be modest for her, it was far better then what she had. The humane society told me she was dying and seemed happy to be with me and that if nothing else her final few days she would feel safe. If I could handle watching her pass away they suggested letting her do so in a safe place. They originally thought she had Parvo. The first vet I took her to refused to see her and made me leave after seeing her in the waiting room without even touching her but luckily the second vet I took her to gave her a look and said she was suffering from a serious case of heart worms. Cured her right up and said she was likely only days from death at the time, so we were lucky the vet took the time to confirm her illness. Within a week she started acting like a puppy again and as she gained weight became a little spitfire! Sadly, the mother of Freya, I had found out, had died from the conditions she lived in about a year after Freya was born. The animals lived in a horrible unkept pin, maybe 10′ by 6′ outside, year round. The whole family, mother, father, and pups (at least till they were sold) and it was rarely cleaned accept when the humane society came out, which was several times a month at times. The breeders were eventually forced to make a shelter for the dogs as well. One of the breeders sons took a shine enough to Freya to let her out of the pin but mostly she wandered the streets of the neighborhood. This is how she managed to get out of her situation and escape the fate of her mother, despite the danger to her wandering active streets. I believe she was destined to be the mother of many litters in her future had she stayed with the breeders if she had somehow survived her illness. It hurts my heart to know that for every Freya there is a dozen dogs like her or more that could not be saved. All those dogs deserved to be saved and I was powerless to do so. The law took my side for Freya and was determined to help me save her and for that I am thankful. Despite Freya’s career as a therapy dog, good citizenship award, features in fine places like StubbyDog. There is high fear of her breed and in some places complete banning and even destroying the dogs when found. She is not allowed in most every apartment complex here in Lexington, renters will not tolerate her breed. I have seen the unreasonable fear in peoples eyes and actions strike them after they find out she is a pit bull. There is a lot of work to be done to dismantle the walls put up against this breed and I am glad there are many out there trying to do just that. So thank you to all that work towards that goal. I do not know if the sons attempted to continue their fathers terrible practices in breeding in such awful conditions but with the loss of Freya’s mother and the loss of the sons father (who was the owner of the dogs) passed away later due to a really bad accident on his property, I do not think that particular “business” is operating any longer. Many of the pups were sold to homes over the years, probably a mix of good and bad homes no doubt. I am certain the color of money was the only stipulation the breeder actually had. @DirkPerfect Thank you so much for filling in the story from your side. So sad about Freya’s siblings and mom, but we are so grateful she escaped and found you! We know it seems overwhelming all the negatives, whether it is neglect, backyard breeders, or misperceptions about pit bulls, but having Freya and doing all that you do with her is really a big part of the solution! And we applaud you for that.